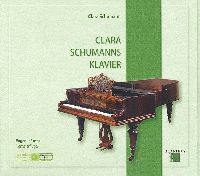 The fifth CD release from the Collection of Ancient Musical Instruments features the fortepiano by Johann Baptist Streicher which was played by Clara Schumann in 1870 in the concert to open the Small Hall of the Musikverein building. The American-born pianist Eugenie Russo plays music by C. Schumann. The programme spans from early pieces, in which the child prodigy shows its immense virtuosity to mature compositions with the depth of feeling which is so typical for Schumann.